I never knew so many people struggle with preparing mashed potatoes at home! I frequently hear from readers or friends that they consistently fail with mashed potatoes. And conversely, people (especially my friend Rachel) claim to crave my mashed potatoes. Back in the hey day of my Sunday dinners, I used to make mashed potatoes for 20 every single weekend. Then life got busy, I had two children, and they fell off my radar for a bit. This is the most basic recipe, but you can fancy them up all sorts of ways. You can roast a whole garlic, then mash it, mince it, and mix it in. You can add a couple of tablespoons of horseradish sauce for an extra spicy kick. You can chop in fresh herbs – either basil or thyme leaves are especially nice. You can mix in blue cheese for a creamy pairing with steak. You get the point. The Permutations and Combinations are endless. 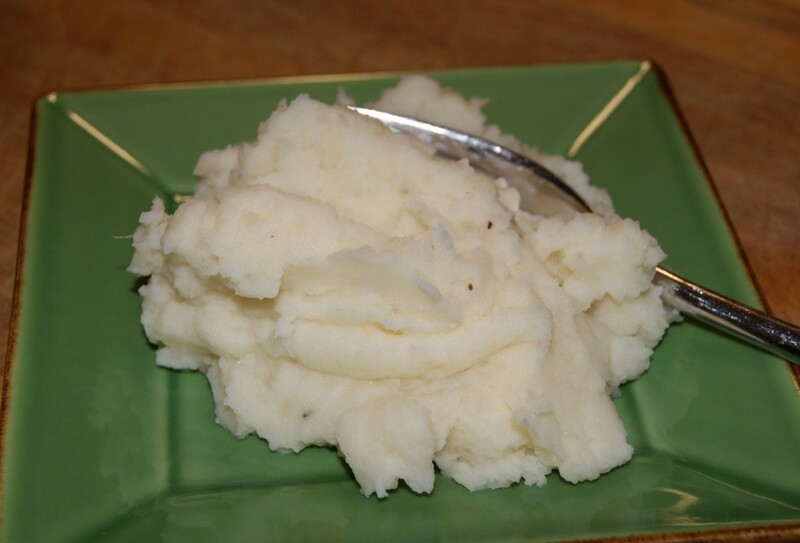 In keeping with my Thanksgiving theme, here are my Top 5 Mashed Potato Tips for home cooks. 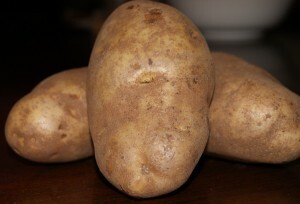 Russet Potatoes. You may know them as Baking Potatoes. These are the ones you see in the photo. Start with cold water from the tap. Place potatoes in cold water, then turn on heat. Buy a potato ricer. If you don’t have a potato ricer use a slotted spoon, then ask for a ricer for Christmas. Use real cream. You can use milk it’s fine, I do it, too. But if it’s Thanksgiving, use the cream, then go run some stairs. One of my Monday Night cooking class participants pointed out that the idea of mashed potatoes at Thanksgiving was really odd to her. Truth be told, I didn’t grow up with mashed potatoes at Thanksgiving either. I think we had sweet potatoes and rice. But if you’re already making gravy, I consider it a crime against humanity not to provide mashed potatoes as a vehicle for gravy delivery. In other news, I woke up to an email from an email from a casting director informing me of a casting call for a new Food Network TV show. Unfortunately, they weren’t asking me to have my own half-hour instructional cooking series where I could wear snappy outfits, cook in a beautiful and well equipped kitchen set, all while engaging enthusiastically with my viewers, and creating my own signature tag line while you watch me lovingly and debate the merits of my latest hairstyle. What they *are* looking for is a team of two people who are dreaming of opening a restaurant. She asked if I’d post the information on my blog, so if this sounds like you, here’s the casting call info. If you haven’t yet had a chance to hop on over to Marx Foods site and Vote for my Beef Tenderloin with Calamarata Pasta in Porcini Mushroom Sauce. They have all sorts of contests going on while you’re there to win some magical bounty of your very own. Just follow the link, click Vote, and then click the button next to DinnerandConversation. As always I thank you for your support and look forward to providing you with as many fresh recipes as I possibly can! Poll will be open through Friday the 19th! Peel potatoes with your trusty vegetable peeler. Slice in half length-wise, then place the cut side down, and slice into 1 and 1/2 inch segments cross-wise. Place cut potatoes in a large pot, then cover with water until the water reaches 2-3 inches above the top of the potatoes. Turn heat on high and cook uncovered. It takes approximately 55 minutes for this quantity to become fork tender. You don’t want them to completely fall apart, but you do want the fork to easily pierce and break a piece into two pieces with a gentle application of pressure. Drain the potatoes into a colander. 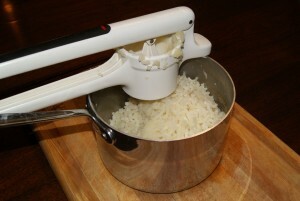 Use a slotted spoon to transfer cooked potato pieces to your potato ricer. Rice back into pan. Bury the butter into the riced potatoes covering it completely. Wait about 4-5 minutes, then add cream and turn heat half-way between low and medium. Gently fold in cream and butter to potatoes, then season with salt and pepper. Taste, then season again. If you’re using kosher salt, wait about two minutes before adding additional salt for the kosher salt to dissolve, then stir and taste. I miss your Sunday night dinners! Those mashed potatoes ARE the best, and like Rachel, I crave them! Nothing beats homemade mashed potatoes the quick fixin’ stuff in the bags can’t begin to compete. I think that a good bowl of mashed potatoes can make any meal great! I have been perfecting my mashed potatoes over the past few years, and the tips/rules you listed were great! I couldn’t agree more with using real butter and cream! It makes a difference, for certain. Thank you for sharing, dear. I hope you have a wonderful Friday! I really need to invest in a potato ricer-I’ve heard they make all the difference. Thanks so much for the tips!